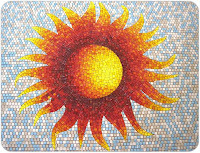 I had another big conversation with a client this afternoon about the wonderful, accessible world of glass tile mosaics. I am suggesting that this particular client forgo the usual accent wall in a great room and that she instead use a glass mosaic on that expansive wall. I cannot get enough of glass tile mosaics, and seeing them used on a huge scale is a thrill beyond compare. Please excuse my hyperbole. There's a company in Oregon called Hakatai (http://www.hakatai.com/). Hakatai sells mosaic tile by the truckload, they sell to the public and will do custom work using fine-cut, cut and uncut glass tile. 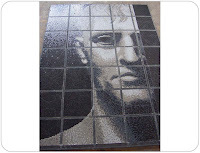 Uncut glass tile mosaics use the same size square tile over their entire design. A lot of times, uncut mosaics stick to geometric patterns. However, by varying the colors of the individual tiles, a mosaicist can convey an alarming amount of detail and subtlety. Uncut mosaics are interesting because they only look right when viewed from a short distance. Simple cut mosaics rely on the square mosaic tile shape for the lion's share of their form, but use cut pieces of those squares to add shapes to a design a mosaicist can't achieve with small square --usually curves. 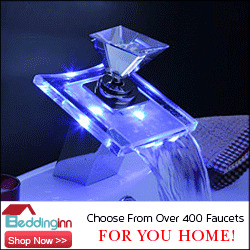 Fine cut mosaics are the most complicated and labor-intensive of these three categories. they abandon the square tile shape all together. Cut mosaics don't rely on distance for you to be able to see them. They look as good up close as they do from far away. 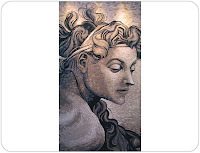 My friends at Hakatai will make you a custom, cut mosaic based on a supplied photo or other image too. Love Van Gogh's "Starry Night?" Do you have a pressing need to have it rendered in glass tile in your foyer? Talk to the kids at Hakatai.